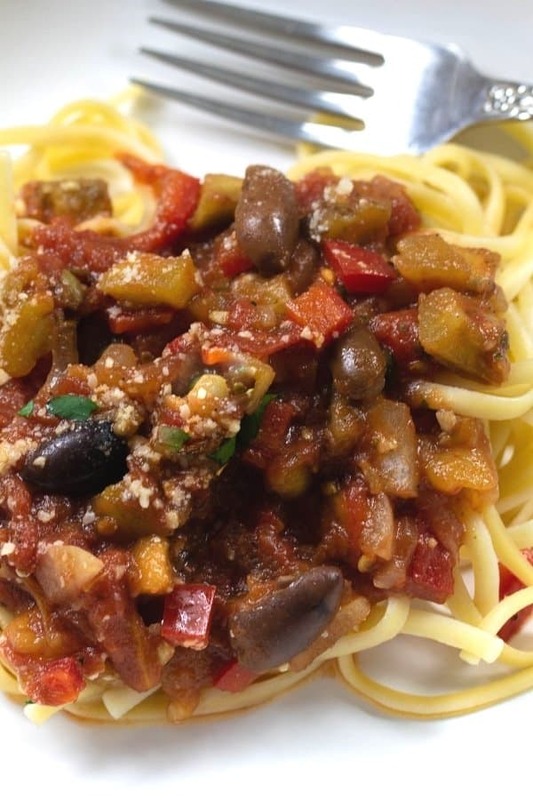 A meatless meal never tasted so good, Eggplant Pasta Sauce is a hearty and flavorful recipe! Eggplant also known as Aubergine, combined with tomatoes and some savory spices make a delicious sauce for pasta. This easy pasta sauce is perfect is ready in about 30 minutes. Perfect for an easy weeknight meal! I love eggplant! Two of my most popular recipes are eggplant recipes! Besides being popular, Slow Cooker Mediterranean Eggplant and Zucchini, Tomato, Eggplant Bake are easy to prepare and delicious! Today I am sharing another family favorite, Eggplant Pasta Sauce! This is one of those recipes that works year round! 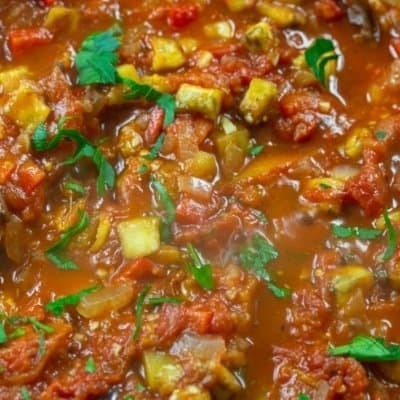 In the summer, use your garden tomatoes and aubergines to make this veggie sauce! This Easy Pasta Sauce is a great weeknight meal because it comes together in about 35 minutes. I find eggplant gets a bad rap! Even some of my kids wouldn’t eat it as children. They all eat this flavorful veggie now! Even my oldest, always a hard sell, slowly grew to enjoy it! If you have not tried aubergines this is a great recipe to start with because the flavors of the sauce are a great blend with the tomatoes, and herbs. I just loving saying aubergines, reminds me of my Granny too! Everyone wants to try it when you say it with an Irish accent too! Eggplant is a heart-healthy veggie! Great for weight loss – high in fiber and low in calories. A great veggie to eat for those with diabetes. Fiber can help in reducing blood sugar. High in antioxidants. For those with autoimmune diseases, a great veggie to add to your diet. Eggplant is naturally low in carbs and high in nutrients. Why do you salt the eggplant before making the pasta sauce? Salting the eggplant before cooking it brings out any bitterness in the eggplant. I usually salt the eggplant for about 30 minutes before using it in a recipe. Do you have to peel the eggplant before cooking with it? I tend to peel the eggplant in most recipes however when I make grilled eggplant. , I tend to leave the skin on to keep the eggplant firm For this eggplant sauce, it is more of a personal preference! Can Eggplant Pasta be frozen? I have attempted to freeze the eggplant sauce and it gets a little watery. I suggest cooking it fresh and using it up, don’t freeze. 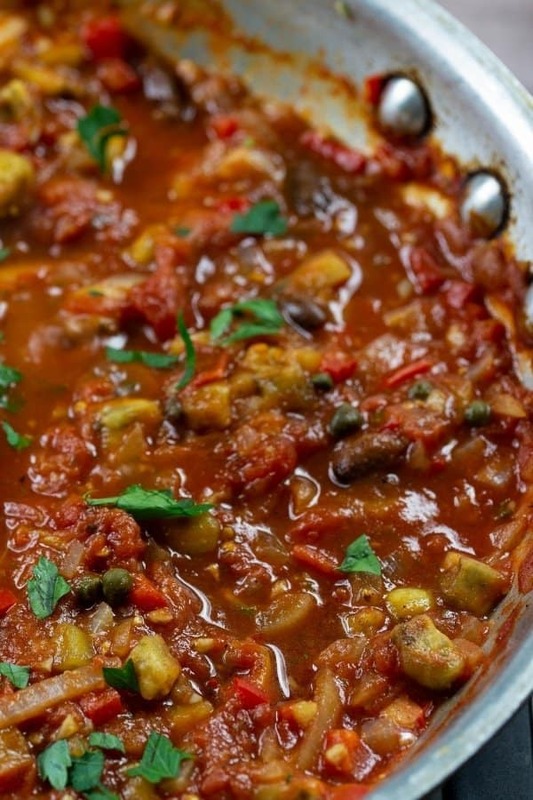 How do I choose the best eggplant for this sauce? The eggplant skin should be shiny and smooth. The stem should be green, never brown. When you squeeze an eggplant, it should be firm but not hard. Take the time to salt the eggplant to reduce bitterness. Keep your eggplant chopped around 1-inch cubes to ensure proper cooking. Use your favorite pasta with this sauce. We enjoy penne, bucatini, and mostaccioli are a few of our favorite. Want to keep this completely low-carb and gluten-free use zoodles or spaghetti squash to serve with the Sauce. Feel free to make the Eggplant Pasta Sauce the day before, the flavors have time to blend. White wi is used in this recipe for flavor. If you do not cook with wine, feel free to use chicken stock. Red pepper is used in this sauce. Feel free to swap another color pepper. 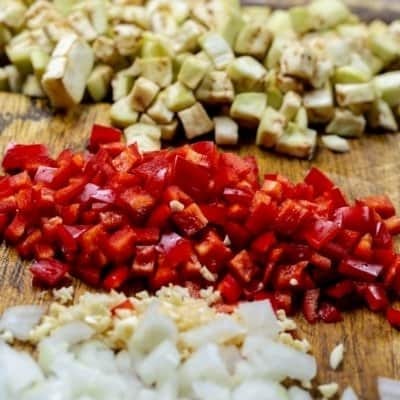 The recipe calls for a yellow onion, a spanish onion or a shallot can be used in lieu of the yellow onion. 12-inch saute pan with cover: I love this non-stick pan. Having a lid also makes this a favorite pan of mine. 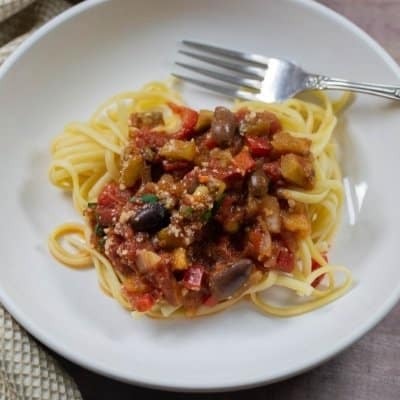 Delicious and flavorful Eggplant Pasta Sauce! Zucchini Mushroom Pasta Sauce: From The Wholesome Dish! 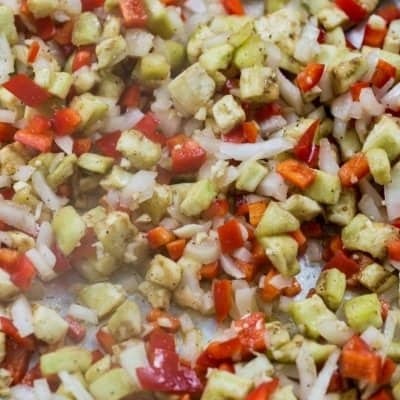 A marinara sauce that is full of flavor from fresh zucchini and veggies, low-carb, vegetarian. Vegan Vegetable Sauce with Chick Peas from Cupcakes and Kale Chips! Oh my, this is another delicious sauce that is quick and easy. Full of flavor and protein from veggies and chickpeas. Cut and dice eggplant, onions, red peppers, and garlic. Salt the eggplant and let it sit for about 30 minutes. Once time is up, rinse eggplant and pat dry. Into a saute pan over medium heat, add olive oil and saute eggplant, pepper, and onion, about 5 minutes. Add in garlic, stir another minute. Season with salt and pepper to taste ( I leave it to you to choose how much to season). Stir in the white wine and stir for a minute or two to blend flavors and reduce wine. Gently add in the diced tomatoes, tomato paste, basil, and hot red pepper flakes. Bring sauce to a boil, reduce heat to a low. Cover with lid and simmer sauce for 20 minutes. Remove lid, add in kalamata olives, capers, and fresh parsley. Check seasoning and reseason if needed. While you make the sauce, make your pasta as well. Serve together. Add shredded Parmesan Cheese as a topping. 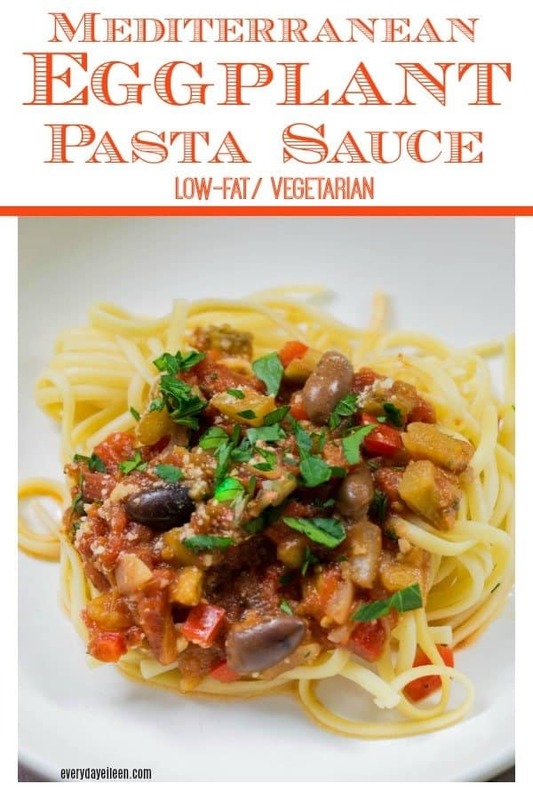 Love this Eggplant Pasta Sauce, I would very much appreciate it if you give it a 5-star rating and share any comments or questions below! 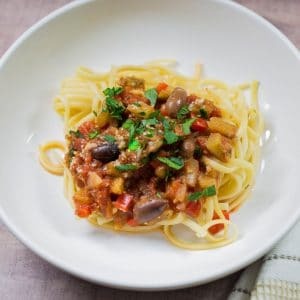 A hearty and delicious eggplant pasta sauce that is full of flavor! Pair with a bowl of pasta for a delicious meal! This is a year-round favorite recipe! It is delicious hot! For an easy summer recipe using your garden veggies, this is awesome at room temperature. Season the eggplant with about 1 teaspoon of salt. Lay the eggplant on a paper towel or in a colander to sweat. (Brings out any bitterness in the eggplant). About 30 minutes. Gently rinse off and dry eggplant. Heat a large saute pan over medium heat, add olive oil. Saute eggplant, onion, and red pepper for about 5 minutes. Stir in garlic and saute another few seconds to blend the flavors. Stir in the white wine to deglaze the bottom of the pan. Cook another few minutes to reduce wine and blend flavors. Stir in the diced tomatoes ( break those tomatoes up with your hands), tomato paste, Italian seasoning, parsley, and red pepper flakes. Season to taste with salt and pepper. Bring to a boil, cover pan with a lid and reduce heat to simmer for 20 minutes. Uncover and cook another 10 minutes to thicken the sauce. Stir in Kalamata olives and capers. Check the seasoning, re-season if needed. Garnish with Parmesan and parsley, if using. While the sauce is cooking, make your pasta or zoodles, serve and enjoy! Note 1: Use your hands to crush the tomatoes as you add them into the slow cooker. Note 2: I use Tomato Paste in the tube. Note 3: use less hot pepper flakes to start and add more if you want a spicier sauce. I use this hot pepper flakes. Note 4: Spaghetti, linguine, or pappardelle are my favorite choices of pasta. To keep this low-carb, serve with zoodles. * The nutritional value is only based on the Eggplant Sauce. I just picked up some eggplant, I think I might make this during the week! Awesome Anne, this is so easy to make and the family loves it! Fantastic Samantha, glad you are enjoying the sauce! It is a good one! I made this tonight and it was amazing! I had eggplant for a few days and wasn’t sure what to do with it and say your recipe. My boyfriend and I loved it! We had it with pasta and a salad.